Trehgrannik, that's quite an unusual name for an author, isn`t it. A reson for me to make further inquiries. There are three persons behind the name: Anatoly Shklyarov, Alexey Paltsev, Alexey Konnov. The group was formed in 2012 and has been successful in publishing eight games up to now, a lot more will follow, according to their webpage. 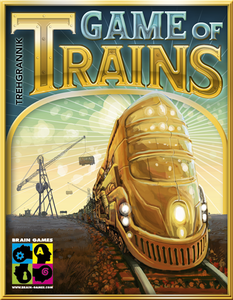 Game of Trains was their fifth creation and is a small funny card game, published by BRAIN GAMES. I came in contact with the largest board game distributor in the Baltic countries in the last year, when the award-winning Ice Cool fascinated my sons at SPIEL 2016. But it was already in 2011, when the company started to develop and publish games of their own. So let us see where this leads us after the huge success of the last year. On their turn, a player can either draw a card or use a card's ability. 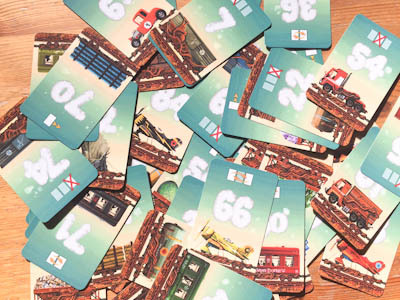 With the first action, a player takes one card from the draw pile and places it in his line of railcars in exchange of another card. He then puts this replaced card face-up in a line next to the draw pile. This makes the ability of the card possible to activate for other players. Swap two cards of your train, either adjacent or two cards, which have 1 card between them. Move one card two spaces right or left. Protect a card, so that this card cannot be removed by the last action. Remove a card in a specific position (e.g. leftmost). All actions except for the last one have only influence on the train of the player, who chose the action. However, with the last action all players are forced to remove the specific card. As a result, all cards that are not protected become usable for other players again. But the removed card must be replaced by a new card that is taken from the draw pile again. As you can guess, the pros and contras of this last action must be weighed carefully, as it influences all other players' numerical orders as well as your own. 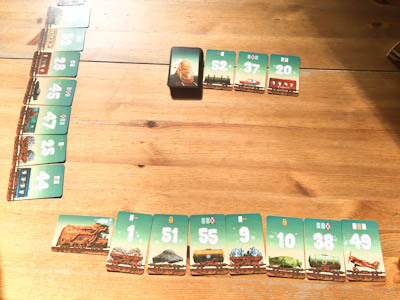 Game of Trains is an entertaining family game. The rules are very simple, but the abilities are still enough for a lot of tension. The artwork is above average with a lot of variation from one card to the next, but it is not really important for the game. The symbols, however, play a major roll and are well understandable. I love those easy filler card games and, as result, Game of Trains currently is one of the games I take along on my journeys.